London and the Thames River from the top of St. Paul’s Cathedral. 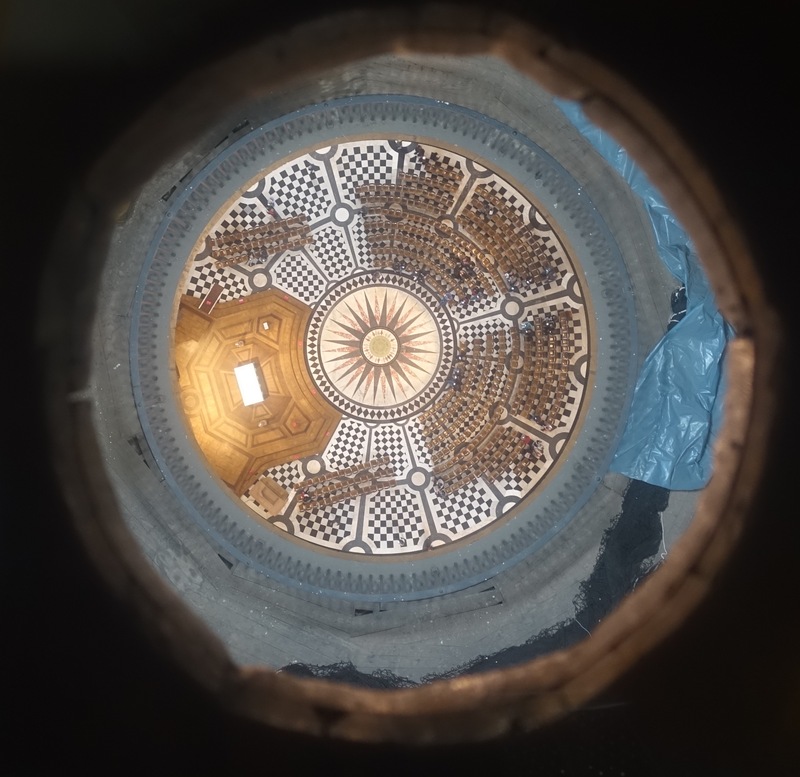 As you climb up to the top of the St. Paul’s dome, there’s one place where they let you take a photograph looking down to the cathedral floor. Then it was back on the tube to St. Paul’s. Kathy and I were here in 1982 but the place is still amazing. My favorite part is climbing the 500 plus steps up to the top of the dome and having a good look around London. Even on a cloudy day, it’s an impressive view of this huge city. Looking back at St. Paul’s from the Millennium Foot Bridge across the Thames. Then there is all the history about the place: A religious site since 604 A.D., a cathedral with a spire even taller than the present dome, the destruction by fires, the design of the present structure by Christopher Wren, the bombing during World War II and the reconstruction since then. 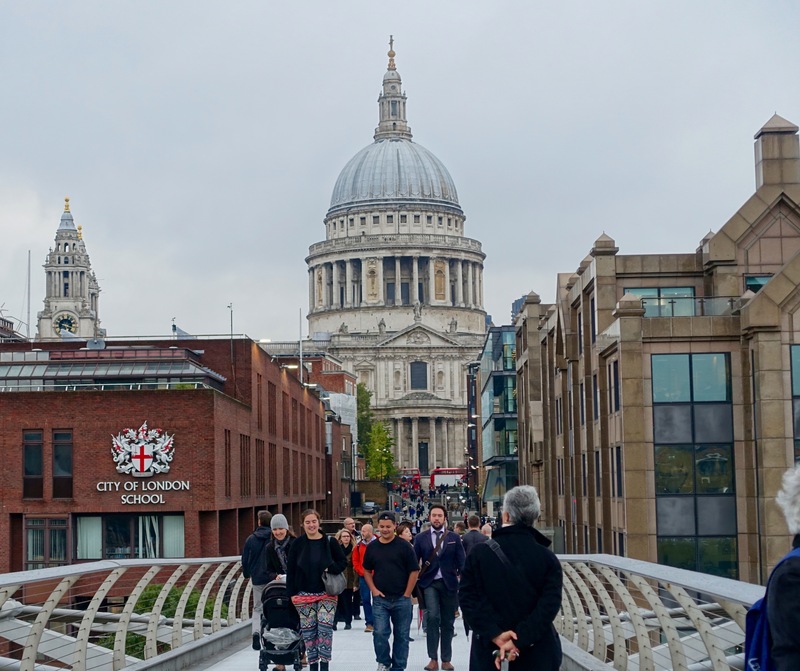 We left St. Paul’s, had lunch and then crossed the Thames River on the Millennium Bridge. That lands you just next to the Globe Theater, which unfortunately for us is closed until next April when the outdoor Shakespeare productions will resume. We somehow got it in our heads that we could walk down to the Tower Bridge, cross it and then walk back to Leicester Square in time for the 7:30 start of the play. We proved that it can be done in little more than an hour — if you set an Olympic race-walking pace and risk your lives jay walking in the dark. 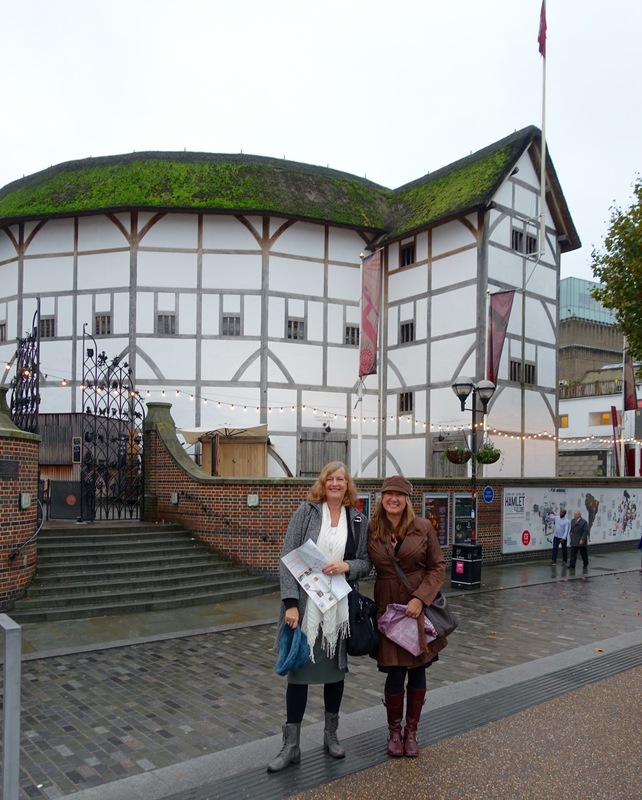 Kathy and Cyndi in front of the Globe Theater. 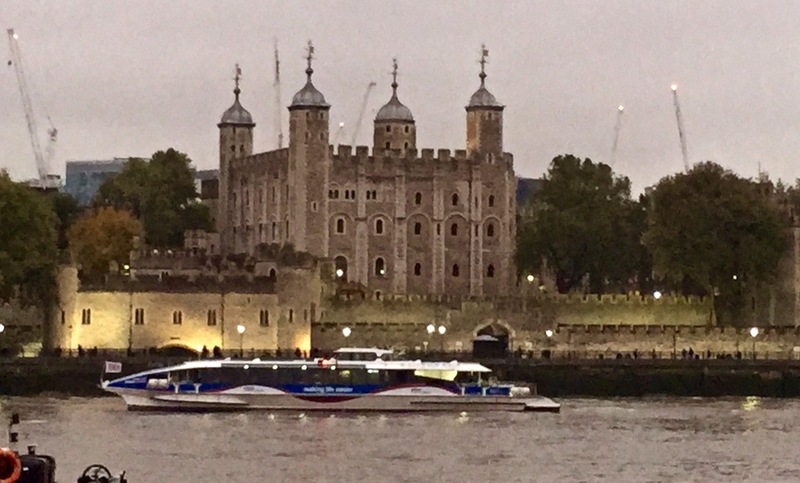 It also means getting only a fleeting glimpse of some sights that we should come back to, although we have already visited the Tower of London during our grand tour in 1982. But we need to get Cyndi, our latest visitor, there before she leaves next week. We were glad that we got in our seats in time for “The Father,” a play by Florian Zeller, starring Kenneth Cranham as Andre, an older man going through the stages of dementia. The playwrights succeeds, I think, where so many writers fail. That is in demonstrating a confused mental state by portraying the confusion in the writing or in the presentation of the play. More often than not, the effort just ends up being . . . confusing, with no understanding or empathy passed on about how terrifying or disconcerting this must be to the sufferer. It’s a grim subject but Zeller and the actors manage bits of humor that keep the audience from retreating to the exits or rustling around in purses or pockets for hankies until the end of the play. See this one if it comes your way. Home on the train. We’re back in London tomorrow to take in a sight and then head for Twickenham for a semi-final game in the Rugby World Cup: New Zealand vs. South Africa. The Kiwis are heavily favored. 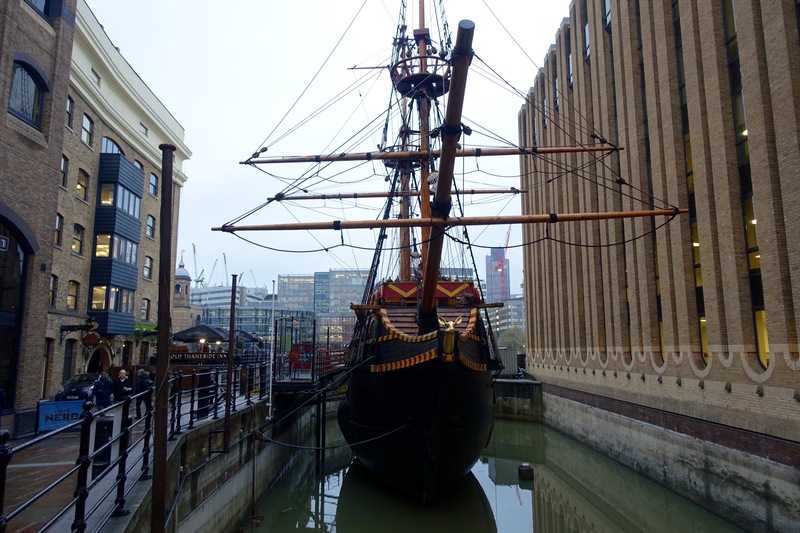 A replica of the Golden Hinde, Sir Francis Drake’s ship. Walking across the Tower Bridge. 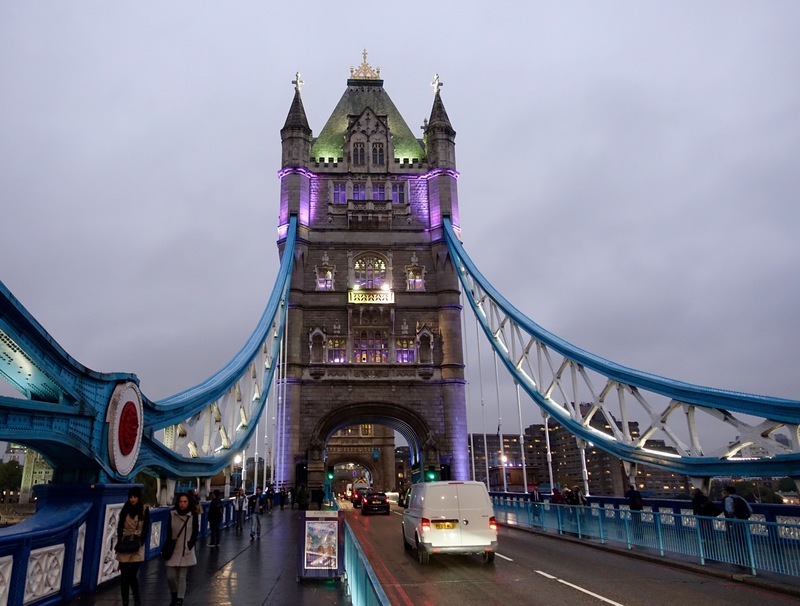 Posted on October 23, 2015 by jbsaulPosted in TravelTagged Florian Zeller, Globe Theater, Kenneth Cranham, Leicester Square, London, The Father, Tower Bridge, Tower of London.